Sweet potato sales have risen steadily over the past three years, driven by increasing awareness of their health benefits. Promote them as a nutrient-packed side dish that is more than just a holiday favorite. Sweet potatoes are rising in popularity partly because of their many health benefits. Vitamin A is found in sweet potatoes. It helps to keep eyes and skin healthy. Sweet potatoes also contain vit-amin C, which is an immune-system booster that can help fight cancer. They have a high concen-tration of carotenoids. Carotenoids, including the vitamin A precursor beta carotene, have been found to protect against carcinogens and preserve night vision. Sweet potatoes contain fiber, which aids in digestion and helps keep your gut healthy. The U.S. Food and Drug Administration has approved the following nutrient content descriptors for sweet potatoes: fat-free, saturated fat-free, very low sodium, cholesterol-free, a good source of fiber, high in vitamin A and high in vitamin C.
For the fourth year in a row, sweet potato sales increased, climbing 4.5% on a 3.8% increase in pounds sold. Per-pound retail prices held steady. Cross-promote sweet potatoes with marshmallows, nuts, brown sugar, vegetable oil and baking supplies. Sweet potatoes are available year-round but are most popular during the fall and winter. Pro-mote sweet potatoes throughout the year. Fall: Sweet potatoes shine during the fall holidays. Promote them heavily beginning in October. Winter: Include sweet potatoes in winter holiday displays as many holiday tables aren’t complete without a sweet potato dish. Spring: Just because the winter holidays are over doesn’t mean you need to put the sweet potatoes away. Offer springtime promotions that promote the health benefits of sweet potatoes. Summer: Include sweet potatoes in summertime grilling displays as a way to get con-sumers thinking about them as a side dish year-round. Offer recipes for sweet potato fries. Offer bulk and bagged sweet potatoes in your display to appeal to consumers seeking both small and large quantities. Avoid stacking sweet potatoes to keep them from rolling onto the floor. Create interest in sweet potatoes during the holidays by creating waterfall displays using graphic cartons. Place sweet potatoes near regular potatoes and onions for a nice color contrast. 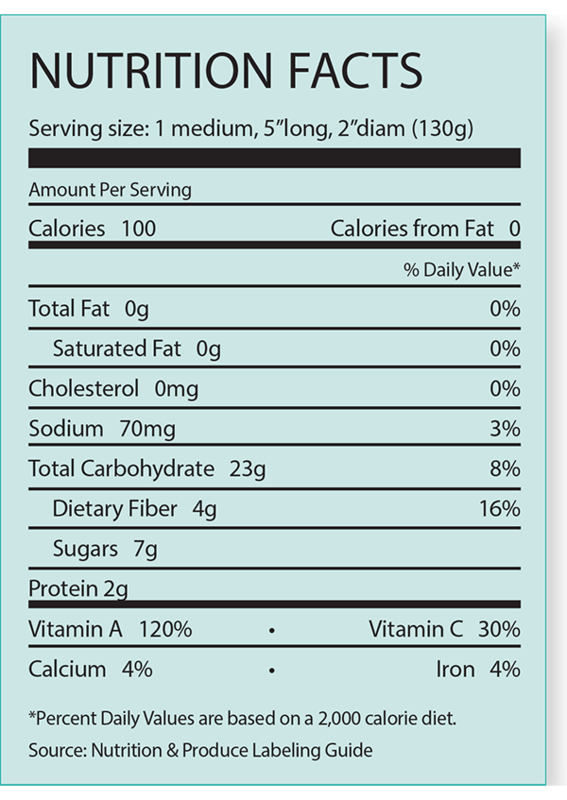 Include information about sweet potatoes’ health benefits on signs on your display. Offer recipe cards and preparation tips. Rub butter on the skin before baking sweet potatoes to make the skin softer. Offer baked sweet potatoes as a side dish. Use sweet potatoes in casseroles and pies. Sweet potatoes can be added to stir-fries and mixed vegetable medleys. Sweet potato fries are often seen to be a healthier option than regular french fries. Offer them as a substitute for regular fries. Always use a stainless steel knife and cool water when cutting sweet potatoes so they don’t turn dark. Temperature: 55 to 60 F, 13-15.6 C Relative humidity: 85-90% Mist: no Typical shelf life: 10 to 14 days after packaging (before packaging, sweet potatoes store well un-der proper conditions for 52 weeks) Ethylene-sensitive (Do not store or transport ethylene-sensitive items with commodities that pro-duce ethylene.) Highly sensitive to freezing injury. (Likely to suffer injury by one light freezing.) Susceptible to chilling injury (Damage sometimes is not apparent until produce is returned to a higher temperature.) If stored for any length of time, sweet potatoes must first be cured for about four to five days at 85 F, 30 C, with a relative humidity of 85-90% or above. Do not refrigerate. 41% of consumers said they purchased sweet potatoes in the past year. Consumers in households making more $50,000 or more a year are more likely to purchase sweet potatoes. Consumers living in the South are in the region most likely to purchase sweet potatoes.